Milk Chocolate Hollow Egg with Caramel and Sea Salt Popcorn. Salted caramel popcorn encrusted in shell. Seriously good chocolate & popcorn. Fairtrade cocoa grown by family farmers in Ghana. Natural ingredients. 100% pure cocoa butter. No palm oil or soya. No artificial flavours. Vegetarian. Brought to you by Divine? 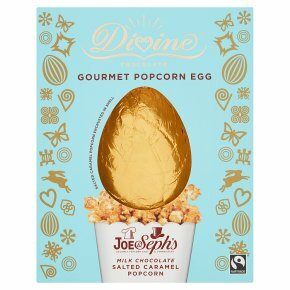 & Joe & Seph's Gourmet Popcorn Chef & Connoisseur The world's first Fairtrade chocolate popcorn egg! Outside it's a seriously smooth luxury egg, but break inside to discover gourmet popcorn embedded in the chocolate shell. Enjoy the unique combination of Divine high cocoa milk chocolate with Joe & Seph's handmade salted caramel popcorn. Careful! This is a handmade product and it's possible that it may contain unpopped kernels.